You may submit an application online at www.greenlightcashadvance.com or over the phone at (941) 400-9644. It is important to provide as much information as possible in your application, as this helps speed up the process in getting your cash advance approved. The state in which your case has been filed. There are 16 states that do not allow pre-settlement funding. This list of states changes approximately every 6 months or so. A state that did not allow funding in the past may allow funding today; and vice versa. Liability. Who is at fault? Type of Injury. The most common cases we see fall under the following categories: auto accidents, slip and fall cases, medical malpractice and other types of injuries. Soft tissue injuries are not accepted (sprains or strains of muscles or ligaments). Insurance coverage. Your cash advance may not be processed without a minimum amount of insurance coverage. We will ask you to inform your attorney that you are seeking funding from Green Light Cash Advance on your lawsuit settlement. 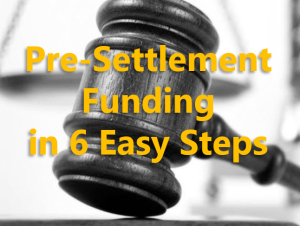 Be advised that some attorneys do now allow their clients to obtain pre-settlement funding. We will ask you about prior funding. If you have already taken a cash advance on your lawsuit settlement your cash advance approval may be limited. You may be ineligible for a cash advance if you have already reached your funding limit. Once we receive all of the required information that we’ve requested from you and your attorney/paralegal we review all the details of your case. This is the underwriting process and it usually takes approximately 24 to 48 hours to complete, which is why it is so important to provide as much information as possible about your case up front. If Green Light Cash Advance has approved the funding for your case, we will send you or your attorney/paralegal the funding agreement. Once you complete the funding agreement - signed, initialed, (and, in some cases, notarized) – and send it back to us along with your photo ID, our funding company will either overnight a check or wire funds into your bank account.